Sediments are an integral part of the ecosystem and can have an impact on both ecological and chemical status of surface water bodies. 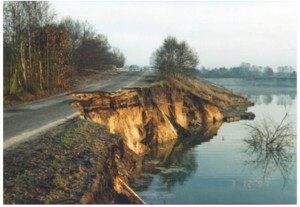 Despite the sediment management is not addressed in the Water Framework Directive (WFD) as a specific issue, the Directive refers to a need of environmental quality standards for priority substances in sediments and to the necessity of undisturbed sediment transport for achieving high status of surface water bodies. In general, quality and quantity of sediments play a significant role in achieving WFD environmental objectives and, therefore, reporting on various aspects of sediment management has to be included in a river basin management plan. WFD Reporting Guidance 2016 provides EU Member States with guidance on how the various aspects of the Water Framework Directive (WFD) should be reported to the European Commission. The following text provides a brief overview of reporting requirements on sediments as described in the WFD Reporting Guidance 2016. Reporting of the second River Basin Management Plans (RBMPs) in 2016 brings a new element into play due to legislation which was not fully in force at the time the first RBMPs were adopted. The Environmental Quality Standards Directive 2008/105/EC (EQS Directive), as adopted in 2008, will be fully in force for the second RBMPs. Some Member States did not implement the Directive in the first RBMPs given the fact that transposition deadline was in July 2010, after the adoption of the RBMPs. A number of elements of the EQS Directive which were not reported in 2010 are relevant for the second RBMPs and these include trend monitoring in sediment and/or biota of Priority Substances. ‘Good surface water chemical status’ means the chemical status required to meet the Environmental Objectives for surface waters established in Article 4(1)(a) of the WFD, that is the chemical status achieved by a body of surface water in which concentrations of pollutants do not exceed the environmental quality standards (EQS). Decision 2455/2001/EC of the European Parliament and of the Council of 20 November 2001 established the list of Priority Substances in the field of water policy. The Decision identified the substances for which EQS were to be set at Community level which was implemented by means of Directive 2008/105/EC (the EQS Directive (EQSD)). Eight other pollutants that were regulated by Directive 76/464/EEC were also incorporated into the assessment of chemical status. The EQSD includes a number of other obligations relating to Priority Substances, among which is the trend monitoring of certain Priority Substances in sediment or biota (Article 3(3) EQSD). Directive 2013/39/EU, amending the WFD and EQSD as regards Priority Substances, was adopted on 12 August 2013. The revised EQSs for existing Priority Substances should be taken into account for the first time in RBMPs covering the period 2015 to 2021. The newly identified Priority Substances and their EQSs should be taken into account in the establishment of supplementary monitoring programmes and in preliminary Programmes of Measures to be reported by Member States by the end of 2018. With the aim of achieving good surface water chemical status, the revised EQSs for existing Priority Substances should be met by the end of 2021 and the EQSs for newly identified Priority Substances by the end of 2027. WFD Reporting Guidance 2016 asks the Member States to report the matrix in which each chemical substance is monitored and this includes sediment, suspended sediment and settled sediment. Moreover, the RBMPs or background documents should include information about how are Priority Substances monitored in sediments and/or biota to assess long-term trends of Priority Substances. Article 3.3 of Directive 2008/105/EC (Article 3.6 in the current version as amended by Directive 2013/39/EU) states that ‘Member States shall determine the frequency of monitoring in sediment and/or biota so as to provide sufficient data for a reliable long-term trend analysis. As a guideline, monitoring should take place every three years, unless technical knowledge and expert judgment justify another interval.’ WFD Reporting Guidance 2016 also asks that if arrangements are in place for the long-term trend analysis of concentrations of those Priority Substances listed in Part A of Annex I of the EQS Directive 2008/105/EC that tend to accumulate in sediment and/or biota (Article 3(3) EQSD), references or hyperlinks to technical documents must be provided by Member State where further specific information can be found. In addition to Priority Substances also River Basin Specific Pollutants have to be monitored in surface water bodies. In case a River Basin Specific Pollutant exceeds its good-moderate EQS it would cause a failure to achieve good ecological status/potential in the respective surface water body. Similarly as for Priority Substances also for the River Basin Specific Pollutants the WFD Reporting Guidance 2016 asks if these substances are monitored in sediment, suspended sediment and settled sediment. The WFD requires that, within each RBD, a Programme of Measures (PoM) is established to address the significant issues identified and to allow the achievement of the WFD environmental objectives. The Directive further specifies that the PoM shall include as a minimum ‘basic measures’ and, where necessary to achieve objectives, ‘supplementary measures’. Basic measures among others comprise measures to prevent or control inputs of diffuse pollutants. These measures include also controls or binding requirements at farm level to address soil erosion and pollution of water bodies with sediment (Article 11 (3h)). The concept of Key Types of Measures (KTMs) was developed in 2012 to simplify reporting. KTMs are groups of measures identified by Member States in the PoMs which target the same pressure or purpose. The 25 predefined KTMs include two measures addressing sediments: KTM4 Remediation of contaminated sites (historical pollution including sediments, groundwater, soil) and KTM17 Measures to reduce sediment from soil erosion and surface run-off. The member States are obliged to report on application of these sediment-related KTMs. The WFD requires co-ordination of the Programmes of Measures in transboundary River Basin Districts and the European Commission will assess whether sufficient co-ordination has taken place in transboundary RBDs. WFD Reporting Guidance 2016 asks if the international RBMP address sediment management. The final conference of the project North-Western Interreg IVB CEAMaS took place on 17 September 2015 in Brussels at BBRI Buildings. This conference was organized by the cd2e (leader of the project) and the 7 partners of the 4 countries having taken part in this project. More than 60 experts and stakeholders concerned by harbor’s dredged sediment management attended this event during which shared outcomes and results on the technical, social, economic and global environmental impact issues were presented. The results obtained through the 5 work packages of the project have made it possible to have a transnational vision on the reuse of harbor’s dredged sediment in civil engineering applications. Tools and studies developed during the project are available on the CEAMaS website. How to continue to share? how to continue innovative approaches? The answer to these questions were given by the perspective to develop a European resource center for circular economy with sediment reuse. This initiative was shared by the majority of the partners and led to the signature of common understanding agreement. The resource center SEDILAB by cd2e organized on 19 and 20 November 2015 for the first time outside the French Nord-Pas-de-Calais region the Sediment National Days (SND). This event was organized in partnership with GEODE (group study and observation on dredging and environment) and BRGM in Brittany (Nantes) and has succeeded to bring together actors (more than a hundred participants) involved and interested in dredged sediment issues in the Atlantic seaboard. The purpose of the opening towards another region is to share the experiment of the Nord-Pas-de-Calais Area concerning the reuse of dredged sediment and to duplicate at the national scale the “Sédimatériaux” approach. An experiment which relates to the methodologies and results achieved through the national approach “Sédimatériaux” and the Interreg projects such as CEAMaS, PRISMA and GetSed…Two subjects were discussed during these days: responsible practices for on the ground sediment reuse and the dumping of the dredged sediment in marine and estuarien environment during the GEODE forum. During the SedNet conference in Krakow (23-26 September 2015) a workshop was organised on the Reuse of (Contaminated) Sediments. The platform was to share each other’s experiences with sediment reuse projects in Europe and the USA. Therefore most of the time was given to the floor to present projects, and how they came to pass. The results can be found at: https://sednet.org/events/sednet-conference-2015/sednet-conference-2015-presentations (10. Workshop on the Reuse of (Contaminated) Sediments). The unified premise was to get behind the notion that sediments should be viewed as a resource and not a waste, and find solutions with other waste streams in which sediments are part of the solution. As an example, the Lift up of Lowlands project evaluated the potential of using dredged sediments to reverse the process of land subsidence in polder areas. For that, lab-, meso- and field-scale experiments were performed and it was concluded that most subsidence of organic dredged sediments was due to shrinkage and not organic matter mineralization. Another example of a new application which was implemented after the SedNet meeting in Krakow is the design of a steel slag dike to prevent slope instability on a sediment storage site. Figure: Impression of a redesign of the sediment storage site, using a steel slag dike (in blue) to prevent slope instability. The sediment needs to be kept in place, but also the sediment prevents leaching of metals from the steel slag dike towards the ground- and surface water. A series of tests were carried out to look at the chemical and physical behavior of both the steel slags and sediments when building a dike with a height of almost 10 meters on top of a sediment layer, on a slope of 1:4. The feasibility evaluation gave a positive outcome; the construction of the dike is possible if done carefully and taking into account a limited downward slip. The design and construction of the dike has been put on the market in April 2016, using the knowledge gained from the tests and model calculations. A second example was less successful. In February there was a call for an EU program called BONUS. The objective was meeting the multifaceted challenges in linking the Baltic Sea with its coast and catchment, and specifically using Eco-technological approaches to achieve good ecological status in the Baltic Sea. We drafted a proposal with four of the companies present during the SedNet workshop and invited additional partners from the Baltic Sea region. Regrettably, the co-founding of the proposal could not be arranged within the deadline of the call. The latest opportunity we see is the new INTERREG call for the region North-West Europe (NWE), opening the 18th of April 2016 and closing the 27th of May 20216. The INTERREG perspective focuses on stakeholder involvement and participation. The CEAMaS project ended with a well-equipped toolbox but with a limited pathway to implement this toolbox. The new proposal focuses on using the toolbox within projects and pilots already going on with regard to sediment reuse. An important part of the proposal is also the concept of looking at sediments from a circular economy perspective. This includes the option of using sediments as a solution to facilitate the reuse of other secondary resources, as was the case for the steel slag dike. While not all participants of the workshop are involved in these three initiatives, there are many more opportunities to look at sediment as a resource. Please send your examples to Sednet (Marjan.Euser@deltares.nl) and we hope to be able to organize a new workshop with more examples during the next Sednet conference in 2017. A paper on abiotic flows has been published last month (April 2016) in the journal Ecosystem Services. Abiotic flows are neglected or addressed inconsistently in ecosystem services (ES) classifications. Theoretical and practical arguments are provided to include them. This supports consistency and optimizes the integration power of the ES concept. The paper also presents three cases to illustrate the importance to society of abiotic flows and their management. The examples demonstrate that especially sediment resources and dynamics play a key role in the provision of abiotic flows of ecosystems. CEDA is running a series of webinars on dredging technology this year – with a focus on the Cutter Suction Dredge and the Trailing Suction Hopper Dredge. The series will offer delegates training, at two different levels, depending on their working knowledge and experience. Foundation level webinars will provide a sound basis on topics for professionals working in the dredging field, who don’t have the basic grounding in the subject, and who may have only a limited experience working with dredging equipment and technology. The practitioner level webinars will serve the more experienced engineers who have been through formal training in the field and have experience with dredging equipment and technology. These events will provide in-depth knowledge on specific aspects of each topic. The webinars are free and are open to everyone i.e. also to non- members of CEDA. Increasing environmental scrutiny for dredging projects has introduced threshold limits for turbidity generating activities (incl. dredging and dredged sediment placement). The setup, basis, monitoring and management of ‘turbidity limits’ is widespread, but very disperse. Therefore, the CEDA Environment Commission (CEC) developed a questionnaire to record, inform guidance and best practice in setting and working with turbidity limits. Please only cover one project per questionnaire when responding. The project information will be treated confidential and will only be used in a statistical manner for the information paper without disclosure of the source. 1-4 June 2016: INBO, Merida, Yucatan (Mexico). 10th World General Assembly of the International Network of Basin Organizations. 1-4 June 2016: WECC-2016 International Conference on Water, Energy & Climate Change, Marrakech, Morocco. Organised by the National Center for Studies and Research on Water and Energy (CNEREE) of Cadi Ayyad University. 15 June 2016: Using Sediment As a Resource, inaugural conference of this Interreg project in Lille, France. You are invited to propose and convene special organized sessions. 12-14 September 2016: 19th International Riversymposium, New Delhi, India. Deadline for submission of abstracts: 31 May 2016. 14-15 September 2016: 2nd European Dredging Summit, Hamburg, Germany. 19-22 September 2016: 13th International Symposium on River Sedimentation, Stuttgart, Germany. 19-23 September 2016: Ecosystem Services Conference 2016 EU – Helping nature to help us, Antwerp, Belgium. This conference will be the biggest European event in 2016 that links science, policy and practice on ecosystem services and natural capital, with a strong focus on practice and implementation. The conference will include nearly 70 sessions. Call for abstracts: The online abstract submission system will be open from 1 April to 15 May 2016. Further there is a Call for stands and a Call for sponsors. 26-27 September 2016: 5th International Conference on Natural Channel Systems, Ontario, Canada. Themes: current science and understanding, applied river management and rehabilitation, governance, asset management and education. 3-5 October 2016: 5th PiE Conference, Budapest, Hungary. Particle in Europe, or PiE, is a bi-annual conference on the measurement, monitoring, and managing of in situ particle size and sediment concentration in the aquatic environment. The meeting is sponsored by Sequoia and the University of Technology and Economics in Budapest, Hungary. Abstracts are due 30 June 2016. 27-28 March 2017: Navigating a Changing Climate, Brussels, Belgium. An international conference exploring the implications of climate change for waterborne transport infrastructure. 7-11 May 2017: SETAC Europe 27th Annual Meeting, Brussels, Belgium. Event of the Society of Environmental Toxicology and Chemistry.